The composer struggled initially with symphonic form. Two early attempts in the 1870s were destroyed. It would be over thirty years before he attempted another, his No. 1, in 1910. As a practice run, he thought he would try his hand at a serenade for orchestra, in much the same way as Brahms had done. The result was the Serenade in E major from 1902 that we have here. Eight years later would come the first of his twenty-one symphonies (as listed on the Röntgen website), a large number for a composer initially wary of, and tentative with, the form. 1930 was a particularly productive year. 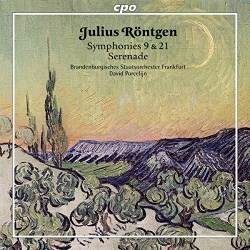 Röntgen produced six symphonies, including No. 9. He confiding to his friend Donald Tovey that he had even written a “bitonal one”. To another friend he added the qualifying comment that it was “ultra-modern”. Up until this work, his music was entrenched in an “honest and unmodern” style, as he himself put it. Modern trends did not really interest him. With this work he wanted to prove that he could untether himself from his comfort zone and prove to the world what he was capable of. I have to say from the outset that the Symphony does not sound that modern to my ears. In fact, it only flirts with bitonality. Though it explores several keys, they never seem to strike simultaneously, thus avoiding any semblance of discordancy. It is structured along the lines of a theme and variations. Material recurs, having undergone alterations along the way. Cast in one continuous movement, the work was completed in September 1930. The four-movement Serenade sits nicely between the two symphonies, offering lighter and more melodious fare. It dates from 1902 and was conceived in a mountain retreat in Semmering, Austria. Prior to this recording, it had only been performed once, in February 1903, with the composer at the helm of the Concertgebouw. At the time critics praised it for its imaginative and deft orchestration, but no-one seems to have taken up the baton. Maybe some at the time viewed it as an anachronism. The warm, lyrical opening movement is memorable. There follows a sprightly Allegretto, where the lightly etched woodwinds contribute more than their fair share. The third movement, a gentle, lilting waltz, reminded me of Grieg. The lively energetic finale is full of optimism and hope, with very much a celebratory mood. The opening theme of the first movement is recalled at the end. The Symphony No. 21 was composed a year before Röntgen’s death. Like No. 9, it is a single movement span. It opens darkly and portentously, and this severe demeanour pervades most of the score. Occasionally it does offer up some fleeting upbeat moments. It consists of six contrasting episodes, almost a set of variations. Some have found echoes of the Passacaglia final movement of Brahms’s Fourth Symphony tempering its structure. Although it can appear a little diffuse, I cannot but admire Röntgen’s imaginative orchestration, which Porcelijn points up with stunning effect. The recordings were made in 2005, and quite why CPO have sat on them for twelve years remains a mystery. Notwithstanding, the engineers have done an impeccable job and the sound is bold, vivid and detailed. David Porcelijn has full sympathy with the music, and his persuasive accounts make a strong case for these absorbing scores.